Practitioners widely acknowledge that inclusive practice equips pupils with the skills required to live full lives. Inclusion in education treasures diversity, fostering our talents and unique abilities, reaching into the heart of our community. 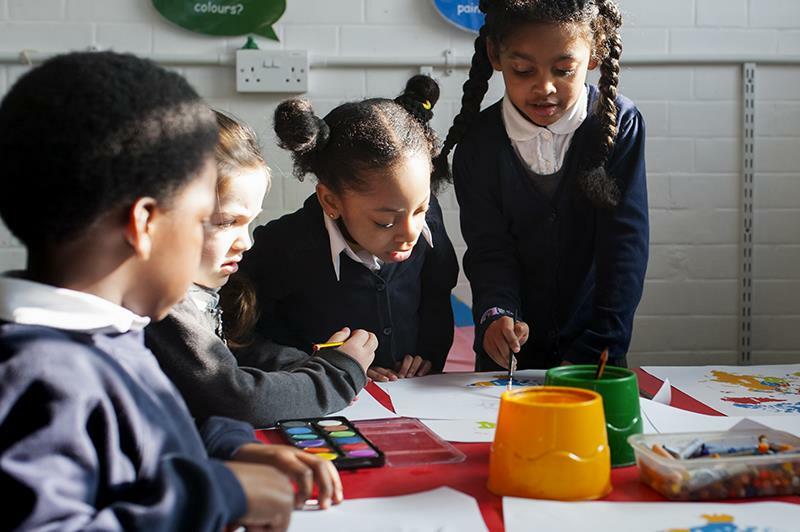 Gainsborough Primary School is a larger than average primary school in Hackney, east London, with a children’s centre and provision for two-year-olds celebrated for its inclusive approach. There are currently 528 pupils on roll. Fifty-seven per cent are known to be eligible for free school meals, 91 per cent are from ethnic minorities and 47 per cent have English as an additional language. Around 18 per cent receive SEN support (national average 12 per cent). Four per cent of pupils are supported with an Education, Health and Care Plan (EHCP), although this number continues to increase over time. The school has high mobility and is situated in an area of high deprivation. Every teacher is a great teacher; every school is a great school. We aim to move incrementally towards excellence in all aspects of our work. All pupils will make good or better progress and will be properly equipped for the next stage of their schooling. High-quality learning environments where pupils feel safe and secure, known and valued and motivated to learn. A bespoke curriculum which broadens horizons and inspires our pupils to become successful learners, confident individuals and responsible citizens. A learning community with opportunities for growth – for pupils, staff and families. Gainsborough Primary works closely with St John and James, an outstanding primary school that is also part of the Primary Advantage federation. There are practical benefits to staff sharing expertise across sites. Both St John and James and Gainsborough Primary use subject specialists to deliver PE, music and art. Since September, music leader Maria Fort has taught across both sites allowing for more opportunities for pupils from both schools to work closely together. Pupils attending the nurture group have thrived, they have been able to form close working relationships with peers and adults, and receive the additional support required for them to take incremental steps towards age-related attainment. Increased socialisation with peers during activities that are well matched to the learners’ needs has also enabled pupils to feel successful but challenged, rather than frustrated. Teachers are well supported by the pastoral and inclusion team. Bespoke pastoral plans denote the specific needs of pupils across each key stage, including their medical needs, Pupil Premium and child protection status and access to any external agencies that may be involved. Effective information-sharing is a high priority – vulnerable pupils are identified by teachers and leaders and sensitively discussed at inclusion meetings held across each key stage. The most high-profile children are escalated to the headship weekly inclusion meeting. This model of distributed leadership and effective communication enables the school to act swiftly and closely monitor pupils who are most at risk, while simultaneously holding to account a range of external agencies, to ensure the needs of our pupils and their families are met. In order to ensure we are fulfilling our promise to the wider community, we need to be able to access and develop meaningful relationships with all sections of the community. This needs to include those that historically have been reluctant to engage – but how do leaders achieve this? We have reached out to the community by increasing opportunities for parents, but also by increasing parental accountability. We have introduced a number of curriculum workshops for parents which have proved to be very popular across all key stages. Our maths workshops, titled “Learn with me”, are designed to demystify the strategies used in lessons so that parents feel more confident helping pupils with their homework. Teachers from each phase deliver a roundtable of fun activities for parents to carry out with their children during the session. Parents are provided with a maths pack to take away as an incentive to continue using the strategies they learn during the session. The curriculum workshops are complemented with a range of community events for parents and carers, such as our annual fireworks event. During Black History Month the school held a cultural celebration and in addition to celebrating Black history with traditional drumming and artwork, parents and staff were invited to bring their national dish. The evening was a wonderful opportunity for the wider community to come together and celebrate each other’s culture and heritage through food and music. As leaders continued to respond to parental surveys, meet weekly with parents during coffee mornings and increase leadership presence at the start and end of the school day, we have found that parental engagement continues to rise. The school has been working closely with the manager of the children’s centre Judy John-Lewis to ensure parents have access to a wide range of services and courses. The parenting groups enables participants the opportunity to share experiences and concerns, ask questions and practise skills. The children’s centre also hosts the Ways into Work scheme, a local initiative offering Hackney residents the opportunity to receive 1:1 support and invaluable advice on entering the world of work, employment and skills. Residents are invited to make an appointment at the children’s centre each Friday from 9am to 1pm. Staff from the children’s centre regularly attend Gainsborough Primary’s weekly coffee morning for parents which has enabled parents to gain a better understanding of the services that are available to them and the opportunities that they are able to access in the wider community. Historically, the school has struggled to maintain excellent attendance. In 2013 pupils missed 5.8 per cent of all sessions (national average 4.8 per cent). However, this has now reduced to 4.9 per cent. And in 2013, pupils receiving free school meals missed 6.9 per cent of sessions compared to 4.7 per cent in 2015. Initially the school acted to ensure the absence policy was being implemented and while this had some short-term impact, in order to tackle those harder to reach parts of the community we needed to adopt more a creative approach. The leadership team met regularly with the pastoral team, attendance officer, and educational welfare officer to devise strategies that would meet the needs of each family. For example, where appropriate the school was able to subsidise the travel to and from school for vulnerable families. In the event the family were unable to meet their attendance target the subsidised travel was revoked. Home visits from the pastoral team were introduced, which led to families taking greater responsibility for their children’s attendance and this also contributed to a rise in progress and attainment. Outcomes for pupils continue to rise steadily for pupils across all three key stages. At the end of key stage 2, results were significantly above national averages in all three core subjects: reading 80 per cent, maths 80 per cent, and writing 84 per cent. Pupils’ progress measure – reading (4.64) and writing (4.27) – places them in the top 10 per cent of schools nationally and pupils’ overall progress measure in maths was above national averages (1.80). Notably, pupils with SEN also make good or better progress from their starting points. Leaders at all levels acknowledge that distributed leadership and inclusive practice has been integral to the school’s recent success. Staff have drawn upon Paul Black and Dylan Wiliam’s research on formative assessment (Inside the Black Box, 2001) with its focus on “creating a culture of success, backed by the belief all pupils can achieve”.